I'm heading home from a whirlwind of back to back conferences (Younique and eWomenNetwork) and I have some really powerful things to share with you all! One of the highlights from these events was hearing Hyrum W. Smith speak at the eWomenNetwork conference. Hyrum W. Smith founded the Franklin Quest Company in 1981. Among the company's other products, Smith created the Franklin Planner and seminars on productivity development based on the “belief window” and other concepts. In 1997, Franklin Quest merged with Stephen R. Covey's Covey Leadership Center to form Franklin Covey. Smith is author of 10 Natural Laws of Successful Time and Life Management (1994) and What Matters Most (2001) as well as other audio tapes. ARE YOU READY FOR MORE PRODUCTIVITY AND MORE JOY?? “To obtain and maintain happiness and inner peace, which studies now prove is the key to productivity, three major gaps need to be closed. If I believe that gravity doesn’t work I will be in trouble. Everyone has the same amount of time. His talk was absolutely transformational for me, and I know the message will be for you as well. LUCKILY – he gave us an extra assignment. He said he wanted us to promise 3 things. – to commit to TEACHING someone else within 48 hours. 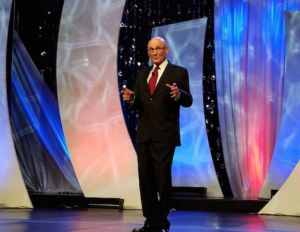 A recap of a talk given by Hyrum W. Smith at the 2016 eWomenNetwork Conference. The objective of closing these gaps is inner peace. We think if we work our nose to the grind stone we’ll be happy. Happiness has to come first!! Belief Gap - Is what I believe to be true aligned with what is actually true. Time Gap - Is there a gap between what I did today and what I said I would do today. Value Gap - Is there a gap between what I value and what I am actually doing. 1. Identify your governing values. Make a list of the things or ideas that matter most. 2. Write a clarifying statement for each value. Give each value vision and clarity. 3. Prioritize your values. Ask yourself, "What would I cross the iBeam for?" A great event indeed. Love Hyrum W. Smith and his teachings. Oh, and the poem, let’s not forget the poem! !